After going through the adoption screening process and going over all the the reasons why a bunny should live indoors, a frequent follow-up adopter question is, “Can Bunny at least go outside to play?” The answer is, it depends on where you live and on your set-up. First of all, it’s terribly unsafe to just open the door and let a rabbit outside. A free-running bunny faces severe consequences: risks such as getting lost, getting hit by a car, or becoming a neighbor dog’s plaything. A rabbit’s outdoor running space should always be enclosed and within human hearing at all times. The mere presence of a preditor can frighten a rabbit to death, so vigilence is important. Shade and water should also be provided. A fenced-in yard may look like a safe environment for bunny to play, but there are many things to consider before bunny ventures outdoors. First of all, rabbits are much smaller than they appear and can easily disappear through small gaps in fences or plants. Parasites such as fleas (yes, rabbits get fleas), toxic plants, and pesticides, are some other dangers to be on the look-out for. Then there’s that natural propensity rabbits have for using their front legs to dig, dig, dig. Though not all bunnies are diggers, you may not know you have a digger until it’s too late. Depending on where you live, you may be able to get away with merely setting up a tall exercise pen in the backyard (if you’re certain you don’t have a digger). It should also be covered or be high enough bunny cannot jump out-and no items nearby that bunny can climb to assist in hopping on over. Most of the time, though, a lot more planning needs to go into a safe outdoor environment. Keeping bunny in and other animals out are key. 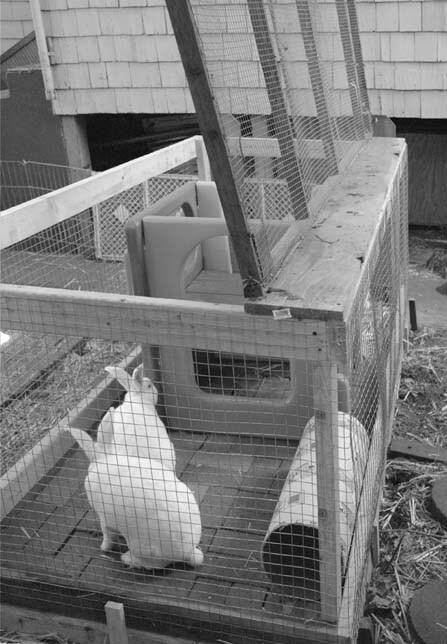 Here are some examples of secure set-ups for bunnies to go outside during the day with human supervision. In photo: rock climbing and hideout caves are offered in this spectacular bunny yard in La Jolla, California. Chain-link fencing arches over the top to keep out preditors. A doorway from the garden allows bunnies access to the house. In photo: at Harvest Home Animal Sanctuary, rabbits can frolic on the hay-covered ground behind a screened wall, with a roof extending over the entire area. 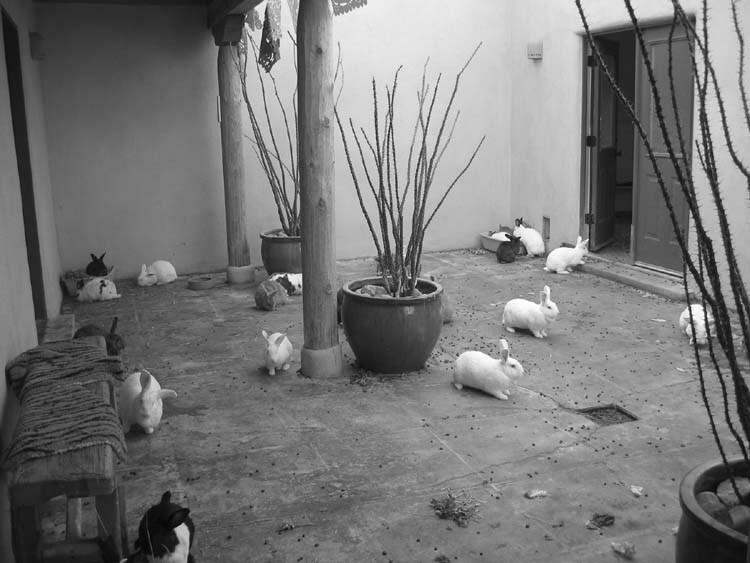 In photo: sixty sanctuary rabbits explore their Albuquerque “placita.” Margo DeMello’s indoor-outdoor home-office lets her check the bunnies while working. In photo: hinged tops and full front gates allow human caretakers to walk in with a broom for daily cleanup. This solution works well in small space sanctuaries in a tightly packed urban setting where neighbors looking over the fence can be assured of sanitation. 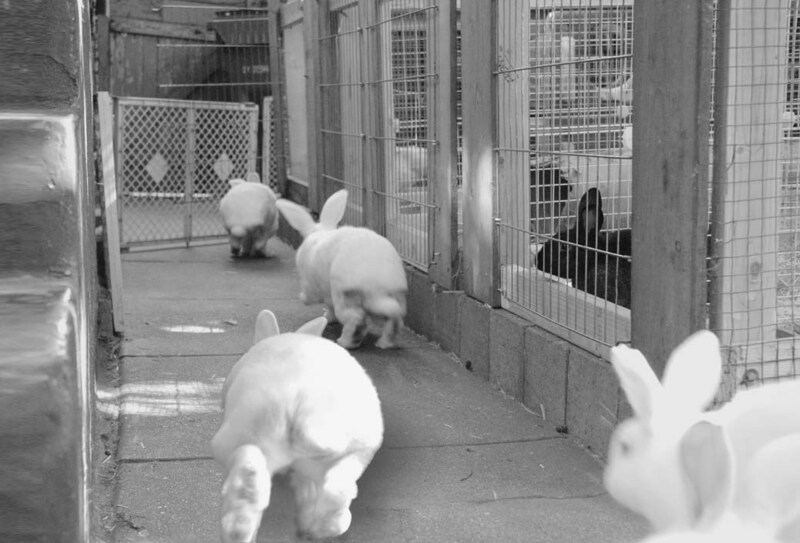 The playpens offer running room for 3-4 medium-size rabbits per pen. 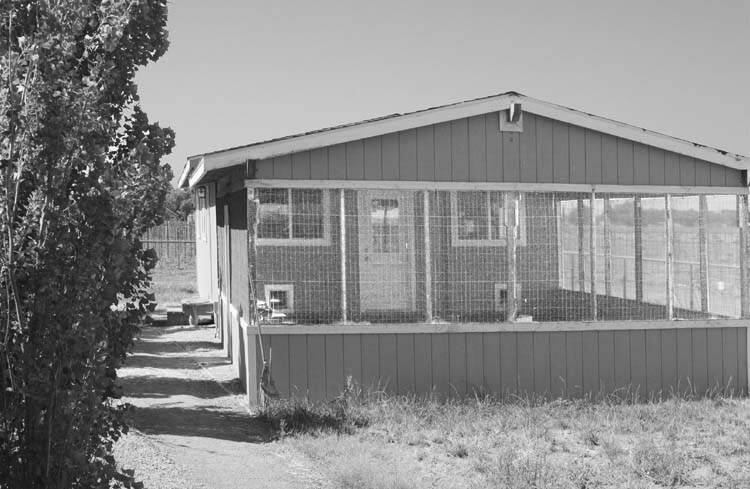 One pen is draped with window screening to protect disabled rabbits who are predisposed to fly strike. Dangers don’t come just from mammals and birds. Flies exist in all parts of the world, and some areas have mosquitoes that carry the deadly-to-rabbits myxomatosis disease. In these areas, HRS suggests covering enclosures in screen or mosquito netting-or not letting bunnies go outdoors at all. In photo: Getting there is half the fun. Exercise is guaranteed when bunnies must hop to and from their runs. 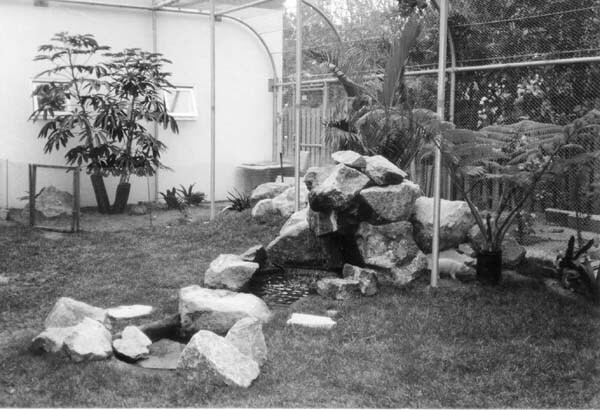 Why go to the bother of setting up an outdoor play yard? House rabbits don’t have to go outside. But rabbits are intelligent animals who appreciate variety. Part of their daily exercise is the process of getting in and out of their regular enclosure, so they can kick up their heels. As an alternative to going outdoors, an indoor exercise pen, a bunnyproof room, or a long hallway works just as well.